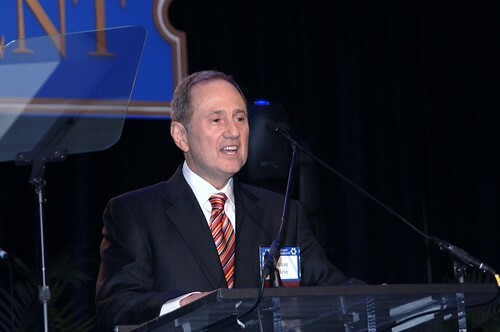 More than 1,200 supporters of the Greater Miami Jewish Federation came together for one important evening – The 2011 Main Event – on Thursday, February 24, 2011. This annual event was a night for our community to celebrate Israel. The keynote speaker was Dan Senor, the co-author of the New York Times best-seller Start-Up Nation: The Story of Israel’s Economic Miracle, which addresses how Israel — a country of 7.1 million people, only sixty years old, surrounded by enemies, in a constant state of war since its founding, with no natural resources — produces more start-up companies than large, peaceful, and stable nations like Japan, China, India, Korea, Canada, and the United Kingdom. The Federation also honored Stephen and Sandra Muss with the 2011 Friend of Israel Humanitarian Award. The Musses are among the most prominent philanthropists in Miami. They are pillars of the Greater Miami Jewish Federation/UJA Annual Campaign, demonstrating their profound concern for Israel and the well-being of our people. And i personally appreciate their creation of the High School In Israel program which i attended as a teen. Click here to read more about Stephen and Sandra Muss. One of the highlights was an electrifying grand finale from Tararam. Through captivating performances incorporating rhythm, drums, dance, lights, music and more, Tararam has made its way into the heart of Israeli culture and thrilled crowds around the globe by offering audiences an exciting and inspiring multi-sensory experience like no other in the world.